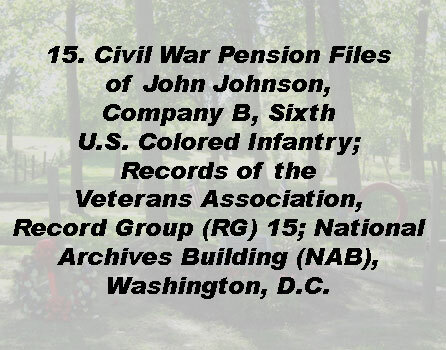 We honor you Private John Johnson of Co B 6th Regiment of the United States Colored Infantry, who at age 26 enlisted in July 1863 in Philadelphia and was honorably discharged in September 1865 in North Carolina. John Johnson was born about 1841 in Stanton, Delaware. Before the war, he was a farmer. 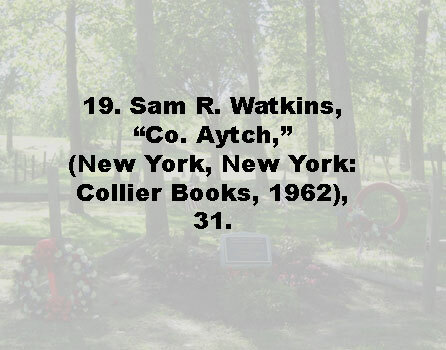 Claiming to be free, he volunteered to serve in the infantry. While digging the Army canal at Dutch Gap Virginia, near the James River in 1864, Private John Johnson engaged in heavy fatigue duty. 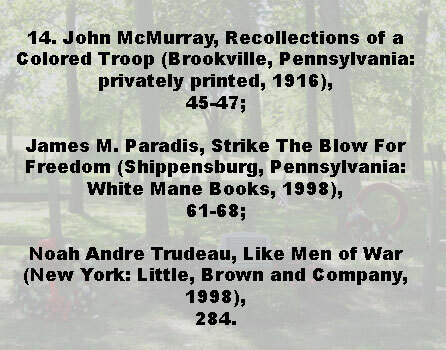 Even though he may have volunteered for this duty, which provided extra pay but was dangerous and difficult, 13 he and his comrades resented the fact that they were often recognized as only laborers in uniform and not as participating combat soldiers. Digging the canal was physically demanding and dangerous work. Confederates firing shells down into the canal ditch made it necessary for the men to dig caves into the walls of the canal to shelter them from explosions. Scarcely a day passed that a man was not killed or wounded. The conditions became even more miserable when the walls of the canal trapped heat from the hot summer sun and prevented the fresh air breezes from circulating. Because of the cramped quarters, inadequate diet, and poor hygiene, workers at the job site experienced a recurring epidemic of fever, diarrhea, and disease. 14 Johnson caught the sickness. In his Pension Files, he notes the sickness at Dutch Gap as the cause for his piles and bouts of diarrhea. 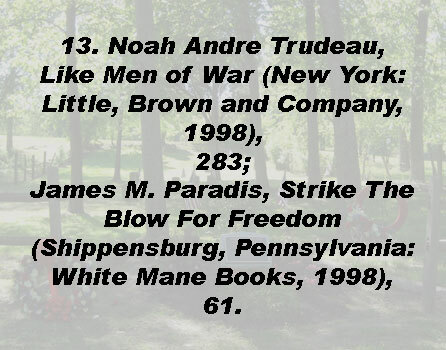 He was eventually hospitalized for an unknown illness from January to September 29, 1865, when he was finally discharged. Sadly, he would never be completely cured. His body would suffer from chronic diarrhea for the rest of his life! In December 1864, close to Christmas Day, Private Johnson journeyed south to Fort Fisher, North Carolina. In his pension claim, written in his own hand, we actually hear a Voice from Timbuctoo. 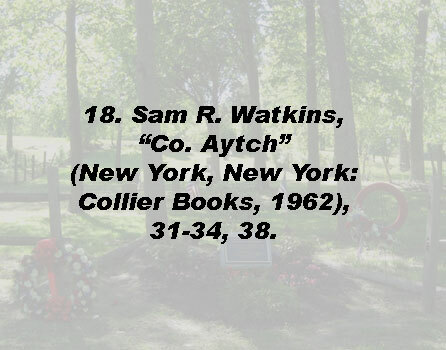 After the war, he made his home in Timbuctoo, where he was a teacher for the all black Timbuctoo School. One of his students was the son of David Parker, the town leader. Johnson taught around thirty students in a one room school house. 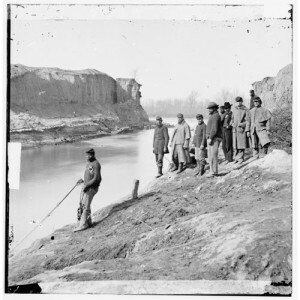 According to the research of the National Museum of Civil War Medicine, there were only 13 black soldiers discharged between 1864 and 1865 due to frostbite. 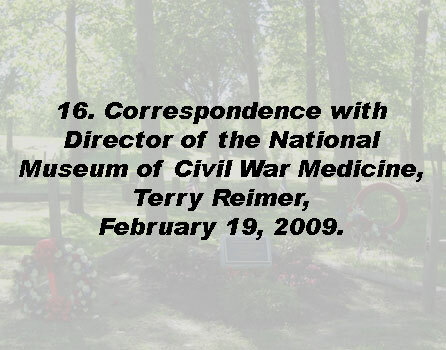 16 However this probably does not account for the less severe superficial stages of frostbite or other exposure related disorders such as chilblains, immersion injuries, and hypothermia that may have been more serious for soldiers suffering from poor circulation disorders. 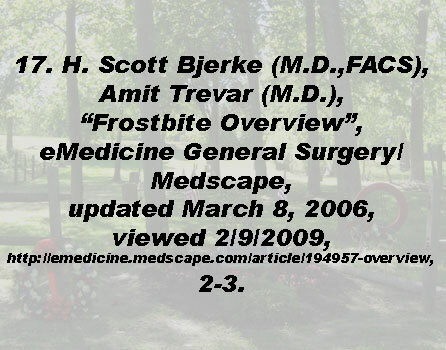 Long term symptoms to frostbite may include cold sensitivity and sensory loss. 17 Such winter injuries were most likely not uncommon during the Civil War, where at times, exposure to sleet, snow, cold whipping winds and icy pelting rains left inadequately clothed soldiers vulnerable to the elements. Sometimes soldiers had to sleep on the snow without tents, stand picket duty under falling snow or icy rain, or march under the same grueling conditions. 18 Severe damage to the skin and tissues would occur when the water in the tissues froze into ice crystals. This depended on the length of exposure and how cold the temperature actually dropped. When nerve damage occurred, a loss of feeling developed in the affected part. When the damaged tissue was thawed and then refrozen, circulation could also be irreversibly inhibited. Often in the most serious and permanent cases where deeper skin layers were affected, toes and feet turned gangrenous black, became infected, and had to be amputated. Although Johnson received no amputation, he claimed to have suffered from this exposure incident for the rest of his life. Because perhaps his nerves and blood circulation had some permanent damage, he could never walk long distances, especially in the cold. After the war he worked not only as a teacher, but also as a farmer and gardener where he had to walk a great distance to his job destination; sometimes when he reached the site, his feet would get so bad and he would be in so much pain, that he could not work and would be bedridden for weeks. John Johnson also peddled or sold small items as a huckster to make ends meet. He married twice. His first wife was Mary J.(?) who died in 1878 in the Burlington Co. Almshouse. Then in Camden, NJ in August 1881, he married Sarah (Graham) Taylor. Children were never mentioned; there were none with the second wife. 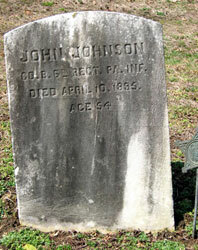 John Johnson died April 10, 1895, 54 years old of kidney disease.